One example of powerful agential roles played by Kashmiri women is the Women’s Self-Defense Corps (WSDC) formed in 1947. This organization comprised Kashmir Muslim as well as Kashmiri Hindu women of diverse class backgrounds. This organization is a compelling example of the formation of a coalition across religious and class divides to further the nationalist consciousness of a society in the process of self-determining. In the second half of the 20th century, Kashmiri women like Begum Akbar Jehan Abdullah, Mehmooda Ahmed Ali Shah, Sajjida Zameer, and Krishna Misri, made a transition from keepers of home and hearth to people engaged in socio political activism within the confines of nationalist discourse. Moving on to the latter half of the 20th century, Parveena Ahangar is a lower middle-class Kashmiri Muslim woman, who after her son was said to be arrested and killed in custody of the security forces, instead of lamenting voicelessly, formed a grassroots organization called the Association of Parents of Disappeared Persons (APDP) in the early 1990s, comprising other bereaved mothers like her. The APDP relies on the cultural and moral authority of the mother, sanctioned by religion and mobilizes women to courageously challenge the apathy and complacency of the political and bureaucratic machinery. However, I observe that this organization has not had a great degree of success in influencing branches of state government responsible for women’s issues and humanitarian assistance. The state government has yet to recognize the worth of the peace-building work that this organization has the potential to contribute to at the local and regional levels. The demand of bereaved mothers for accountability and the return of their children is yet to be employed for the reinstatement of democracy and restoration of justice. This organization, like the Northern Mothers’ Front in Sri Lanka, is mobilized “around women’s role as mothers and their duty and moral obligation to protect their children,” so, again like the Northern Mothers’ Front, the APDP has “never challenged disempowering or limiting gendered roles” (Samuel 2001: 193). There are other instances of women’s mobilization, which some Kashmir analysts might see as agential but, which I would argue, attempt to validate the “isolationist admiration” of Kashmir, of which I am wary. 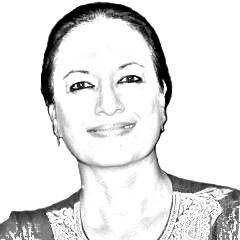 For instance, the Dukhtaran-e-Millat (DM), instead of pressing for women’s political empowerment and addressing the protracted crises of security and legitimacy, sanctifies the reductive portrayal of a Muslim woman as a veiled sociocultural icon who is mobilized more for who she is than for what she believes in, ignoring the diverse interpretations and the rich heterogeneity of cultural traditions This assertion of the salience and meaning of the identity of a “Kashmiri Muslim Woman” takes the form of trying to legitimize sociocultural practices like veiling, polygamy, punitive action against behavior deemed “unIslamic,” such as the mixing of sexes in public places, in an attempt to define the “proper” place of women. The regressive discourse propounded by this organization is highly questionable. It would be good to remember that the model of hierarchy between men and women might be institutionalized in legislations made and executed by the state or in Muslim Personal Law, but gender ideologies are neither impenetrable, nor do they remain fixed till kingdom come. Even when cultural values and religious law are incorporated into legislations, they are capricious and subject to personal discretion (Doumato 2000: 228). On the other end of the spectrum is the Daughters of the Vitasta, a Kashmiri Hindu women’s organization, which seeks the resolution of the Kashmir conflict in the creation of a separate homeland for internally dislocated Kashmiri Hindus within the Valley. The Daughters of the Vistasta is an exclusionary Kashmiri Hindu women’s organization, comprising middle-class, and professional women. Lower-middle class Kashmiri Hindu women are not part of the upper crust of this organization. These organizations are glaring illustrations of those insurgent manifestations of the armed rebellion and counterinsurgency in Kashmir that are striving for exclusionary and patriarchal nationalisms. It might be useful to point out that the DM comprises educated as well as uneducated women of the lower middle-class. Its influence is restricted to the summer capital of Jammu and Kashmir, Srinagar city. The ideology and politics of this vigilante group have not seeped into grassroots cadres in rural areas. My contention is that fundamentalist ideologies of organizations like the DM and the Daughters of the Vitasta have grown in spaces created by structural inequities, repression, and a sense of injustice by state and non-state actors. Although the Daughters of the Vitasta would align itself with an ultra Indian-nationalist ideology, its growth is the blowback of the dislocation and displacement of the Kashmiri Hindu community subsequent to the inception of armed insurgency in 1989, and the inability of the Government of India to take substantive measures toward facilitating its return and rehabilitation in the Kashmir Valley. The Daughters of the Vitasta gives an essentialist Hindu identity a privileged place in political discourse, unambiguously defining that identity and projecting it in order to solicit support. An astute observer must recognize that given the gender, ethnicity, and class status of the members of the DM and the Daughters of the Vitasta, they experience and recover from the effects of violence, displacement, and disenfranchisement differently. Also, both organizations espouse an identity politics that “appeals to that part of individual identity that is shared in a collective identity.” But, “the question to ask about this kind of politics is, ‘Which collective identity?’ It is a question that is never asked in the process of political mobilization on the basis of identity; indeed, the question is often actively suppressed, sometimes violently” (Smith 2001: 36). These organizations do not have clear nation-building programs, which would involve reviving civil society, resuscitating the shattered economy, providing sources of income, and building social and political structures. How will these organizations pave the way for sustainable peace, human rights and security which would diminish the potency of militarized peacekeeping, following closely on the heels of militarized interventions? I would assert, more work needs to be done to strengthen the work of women in civil intervention in the conflict, campaigns for demilitarization, rehabilitation of dislocated Kashmiri Hindus, rehabilitation of detainees, revocation of draconian laws, and restoration of civil liberties. The essentialist politics of the vigilante groups I have explored do not allow for change that would enable “peaceful conflict resolution, reconciliation between traditional enemies, justice between different races and gender equality” (46). It is in the arena of domestic politics that changes in gender composition to favour women today would have an enormous impact on policies and practices, and such rearrangements of roles could be seen as responses to the need for social processes of a pro-democratic and pro-feminist kind.